Today I am going to share with you a way to make easy money from home in South Africa using just your cellphone or computer. This a a good way to earn some extra moola especially if you are a student or have just started an internship or beginner level job that does not pay well. The best part about this method of making money is that it does not take a lot of time. I will share with you. Remember how Uber got famous, you would sign up for Uber and then you would invite your friends to join Uber and then both of you would get free rides. Imagine if you could get those same types of benefits but this time instead of free rides you could get free money. Well a few months back I shared a post about how to earn free bitcoin by joining affiliate programs for cryptocurrency exchanges. The problem with affiliate programs is that you earn money from the fees that the exchanges charge and the fees are 1% of less, so in order for you to earn you will need to refer someone who spends big bucks on a regular. Additionally you only earn when the person transacts so it may take a while to start seeing earning from the time you refer someone to the time they purchase something. To make money you would have to refer a lot of people and hope that some of them invest big money into bitcoin. Coindirect, one of the leading bitcoin wallets and exchanges in South Africa has an affiliate program and they recognised that affiliate programs take time and volumes, so they have devised another incentive to get people involved in cryptocurrency investing. An earn program that works in the same way as the Uber referral program. Instead of free rides you earn XRP (Ripple) when you refer someone and they also get credited with XRP. 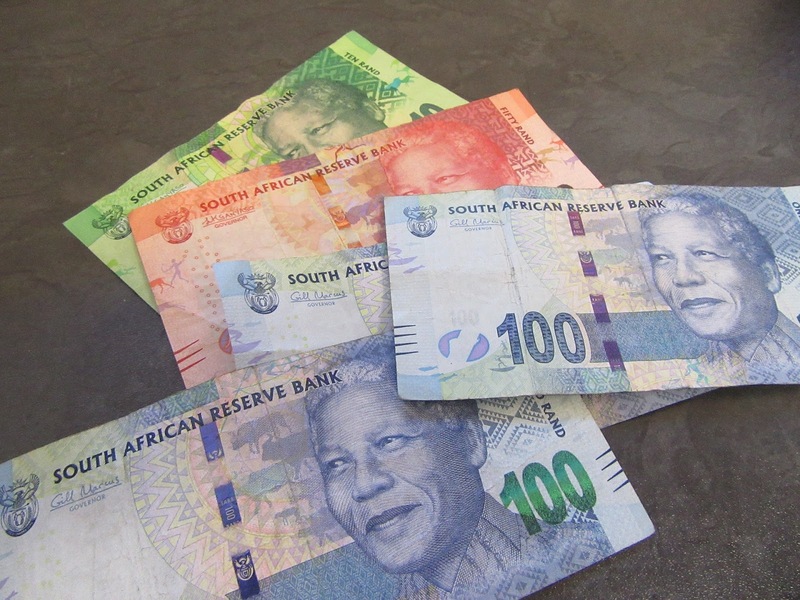 - When that person performs their first transaction e.g buys bitcoin, you can an additional 5 XR (currently R22). 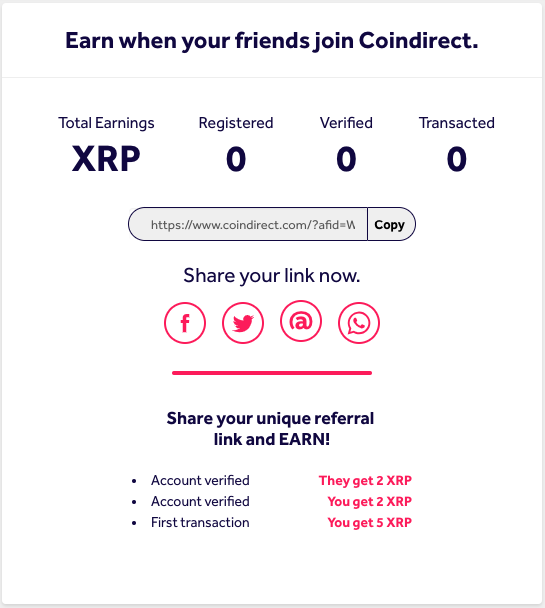 Coindirect allows you to convert XRP to ZAR (Rands) therefore you can withdraw the money into your bank accounts once it's enough or use it to but bitcoin or other cryptocurrencies. If you are good at social media you can earn a lot just by scale from 1 a day to say 10 a day your earning potential increases. Sign up for a free Coindirect account and start earning now. To regularly check the price of XRP got to this Coindirect XRP page which has the current exchange rate. 1. Open a free Coindirect account click on the earn tab and share you link on twitter atleast once a day. 2. Share your link with your friends on Facebook so they can start earning too. 3. Share your link on instagram letting everyone know to get in on the action and ask them to use your link to say than you. 4. Share your link with all your WhatsApp contacts telling them to thank you for letting them know by using your link to sign up for a free wallet. Just like those religious messages that say you must share with the 20 people but this time you will all make some moola. 5. Create 2 minute youtube videos about how to open a free bitcoin account, how to buy bitcoin in SA and how to earn free money using the earn program. This is easy to do on smart phones you just record your screen as you do it and do a voice over explaining then you upload to youtube. That is all for today, subscribe to Sa Varsity Student via email to get our latest posts, also like our page on facebook.